Wax Breaker: Baseball card makers putting in half the effort? I'm sure that it has come to some of your attention that cards lately are not matching up. Many cards I have been looking at lately have players that have been traded. Them being traded doesn't bother me at all. The thing that bothers me is the players being in their old uniforms while the card has the new team name on it. One that bothers me the most thus far is Johan Santana. He was dealt to the Mets at the beginning of the year. I know that most pictures had already been taken of him in a Twins uniform but i feel that in the later sets coming out, they could take a new picture. Another player I see often in the wrong jersey is Miguel Cabrera. He has been with the Tigers for some time now but in every card I get of him has a big ol fish on it. 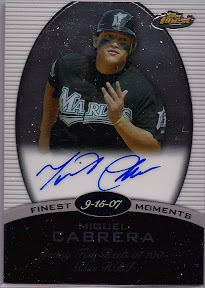 Now I know the finest card shown is a finest moments card that he achieved when he was with the Marlins. Its cards like that I can except as having the wrong uni. I'm sure there are some key facts/secrets about cards I'm missing. However as a new collector it annoys me a bit. In hindsight I guess its better to see them in an old jersey than a victim of a shotty airbrush job. How about digitally enhanced mega good airbrushing? The mismatched effect drives me crazy. Yeah I can only hope that in Topps Series 2 doesn't do as much airbrushing. It would really save JCF's and my livers. Damn you Topps drinking game. Thanks for visiting nmboxer!